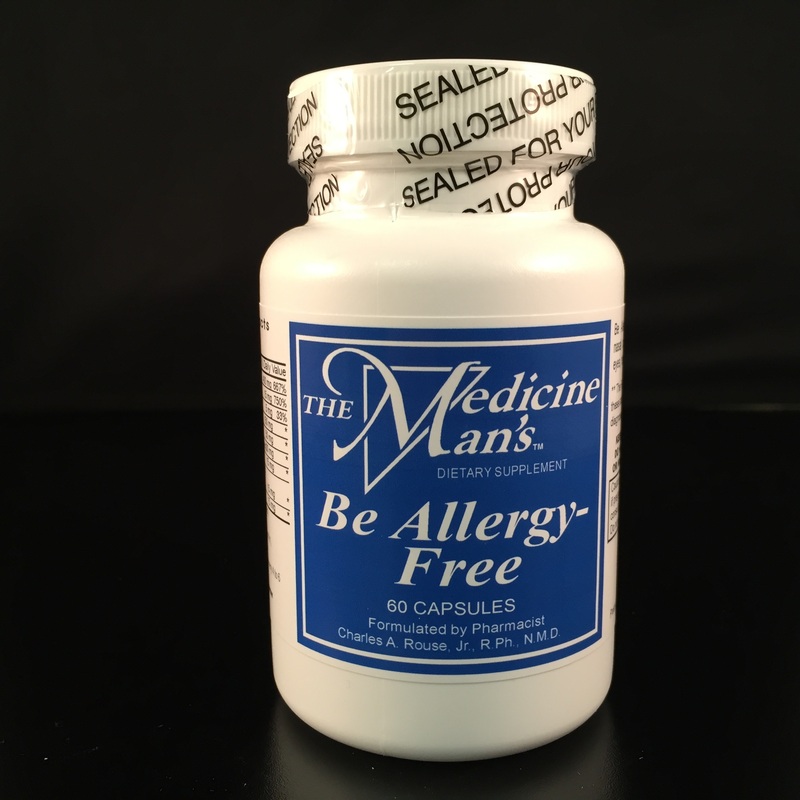 The Medicine Man product, Be Allergy-Free, was designed to attack back at your allergies. Since there's only so much you can do to avoid allergies, attacking the root cause of the allergies with herbs can bring about immense relief. It's not practical to live at the beach or in the mountains all year where there's less pollen in the air. Therefore the special herbs have it. Be Allergy-Free is loaded with serrapeptase + astragalus + eyebright + hesperidin. In order for an allergic reaction to occur, an allergen has to penetrate deep into the nasal lining. When the mucous membranes are healthy and intact, the allergens don't stand a chance. They can't reach the cells to trigger a reaction. Taking glutathione on a daily basis ensures that the cells are strong and every thing they were meant to be. Even the ingredients in the Be Allergy-Free help fortify the cell membranes.Supporting the immune system is a critical step in combating allergies -- especially hay fever. Be Allergy-Free can help in relieving nasal congestion, coughing, wheezing, itching, headaches and fatigue associate with allergies. It's a very good way to minimize the body's responses to seasonal as well as perennial airborne allergies. There's only so much you can do to avoid allergies. Unless you spend all year in the mountains or at the beach (where there's less pollen in the air), hay fever or allergies is probably a common event in your life. Then when you add in the everyday triggers such as mold + dust mites + cats, you've got a lot to contend with. My premise is not just to try and avoid the allergic reactors, but to attack back full force before the histamine or leukotriene release takes place. That means making the immune system promote a healthier response. It's the mucous membranes and the tiny cells that need the most help. Supporting the immune system is a critical step in combating allergies -- especially hay fever and pollen sensitivities. If your allergies are seasonal, begin treatment about six weeks before the season starts and continue through the course of the season. Down here in Georgia where I reside, the golden rod is coming soon. Setria's GLUTATHIONE is a splendiferous way to support the cells of the body and help the immune system to be all that it can be.